High quality bar railing system for use in pubs, bars, restaurants, shop fitting and residential settings. 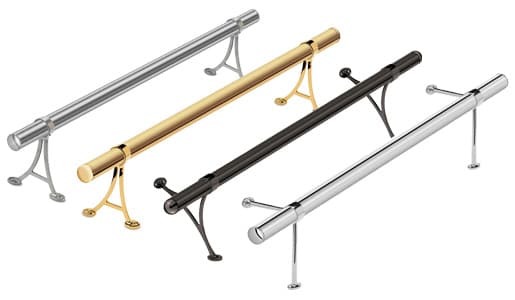 Bar foot railings add a great level of authenticity and comfort to any hospitality setting, with a full range of mounting brackets, end caps, tube connectors and elbows available to suit every eventuality. Bar handrails and arm rails are the perfect way to add a touch of class and luxury to any bar or counter setting. 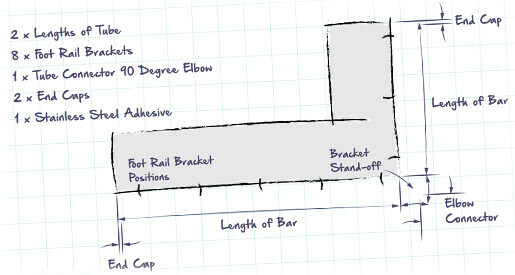 Use a measuring tape to calculate the dimensions of the bar and create a rough layout sketch to determine the ideal position of foot rests or handrail. Choose the style of mounting bracket to suit the look and feel of your project. Tip: Remember to take into account the foot rail bracket stand-off in your calculations. How much tubing you will need, remember, it is always better to have too much than too little. 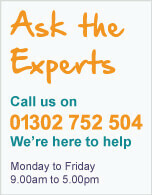 How many foot rail / handrail brackets, we recommend a spacing of no more than 700mm apart. How many tube connectors and elbows are required to complete your design. Don't forget end caps, ideal for finishing open tube ends. 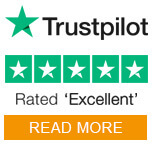 Stainless steel tube is available in lengths of 2.5 metres (2500mm), for lengths over 2.5 metres we recommend using an in-line connector for joining tubes together. For the right amount of support we recommend positioning a bracket at no more than 150mm from each end of your foot rail, intermediate brackets should be spaced evenly between these end brackets with a maximum spacing of 700mm. Pillars and arm rail brackets designed for horizontal mounting, offering a quick and easy bar railing solution. These allow you to connect corners and lengths of stainless steel tube together with the use of a high strength stainless steel adhesive. Provide the perfect finishing touch to any new bar rail, simply choose the style of end cap fitting to suit your setting. High strength stainless steel adhesive is required for secure fixing of flush tube connectors and end caps.